Friday's attack on a Tunisian beach comes just months after 23 people were killed by gunmen at a tourist spot in the capital, Tunis. Tour operators and airlines are canceling flights to Tunisia and offering to rebook vacations for free after a bloody terrorist attack at a beachfront hotel. At least 37 people were killed and 36 injured in the attack Friday near the coastal city of Sousse. Some of those killed were reportedly staying at the Riu Imperial Marhaba Hotel. 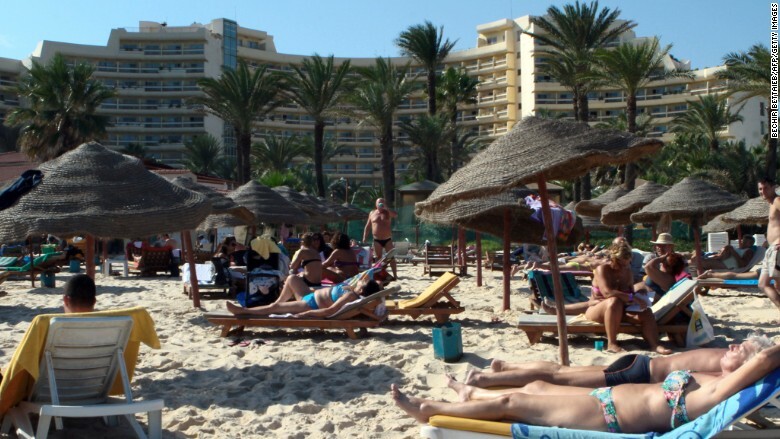 German travel conglomerate TUI (TUIFY), which owns the Riu Hotel group, confirmed there had been an attack on the hotel's beach. "TUI expresses its deepest condolences to the families of the victims," it said in a statement. Holidaymakers can change or cancel their bookings for the current summer season free of charge. TUI will also fly customers out of Tunisia early if they wish to leave. TUI tour operators Jetair, Sunjets.be and VIP Selection have canceled departures to Tunisia, but will operate flights to bring holidaymakers home. Britain's Foreign Secretary Phillip Hammond said there are five Britons confirmed dead and the Irish government said one of its citizens had been killed. Tunisia's government told CNN that the wounded include British nationals, three Belgians and one German. Low-cost airline EasyJet (ESYJY) said passengers booked on flights to Tunisia could change their plans for free, or claim vouchers for future travel. Thomas Cook, which operates hotels in the area, said customers could change their bookings free-of-charge for Tunisian holidays in June and July. Tourism is critical to the Tunisian economy, generating over 15% of the country's GDP at around $7.4 billion, and supporting nearly 14% of jobs, according to the World Travel & Tourism Council. A tourist from the U.K., who was near the attack, told CNN she heard gunfire and then saw bloodied bodies lying in the sand. Hotel guests in the area were taking precautions by putting mattresses up against their doors to slow any gunmen who might try to force their way in, she said. According to the firm's website, the Hotel Riu Imperial Marhaba is an all-inclusive five-star resort with 366 guest rooms. Parent company TUI runs about 300 hotels in 24 countries. It employs 77,000 people and has businesses that include travel agencies, tour operators, airlines and cruise ships. TUI is traded in London and Frankfurt and has a market capitalization of 9.3 billion euros ($10.4 billion). In March, at least 23 people died when gunmen stormed the landmark Bardo Museum in Tunis. Until Friday, that attack had been the deadliest on tourists in the Arab world since a massacre in Luxor, Egypt, in 1997. -- CNN's Vasco Cotovio and Susannah Cullinane contributed to this report.